Exclusive 12, 8, 5 or 3 Easy Payments ⚡ Electro-Voice EKX18SP 18 Inch 1300 Watt Powered Subwoofer only at AMS! Free 2 Day Shipping ⚡ Free Extended Warranty ⚡ Call our Gear Experts at 800-319-9043 for expert advice! Putting together a new sound system? 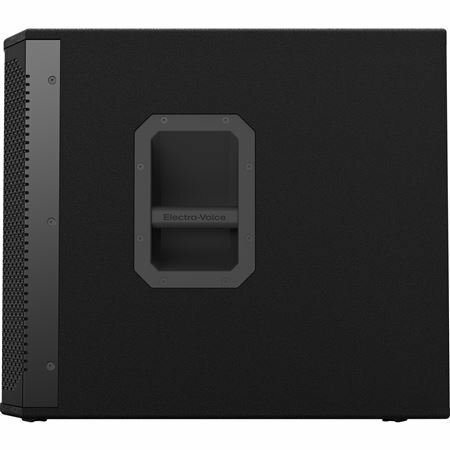 Build from the bottom up with an excellent subwoofer offering plenty of power. Upgrading your current PA? Take a load off your existing components and let your new powered subwoofer do the heavy lifting. Whatever your needs, the EKX18SP from Electro-Voice has it all. Gobs of incredibly clean digital power. A massive low-frequency transducer. Robust cabinetry packed with innovations. And of course, the best-in-class QuickSmartDSP circuitry with Cardioid Control Technology. When you need to produce maximum sonic impact with minimal effort, let American Musical Supply be your trusted source for the entire Electro-Voice line of professional loudspeaker products – including the EKX18SP Powered Sub. Adding a subwoofer may be one of the best investments you can make to improve your live sound, whether starting from scratch or enhancing your existing system. And it’s not just about adding more bass. 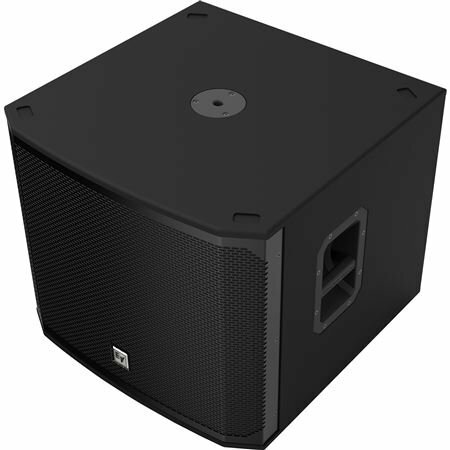 Using a powered subwoofer minimizes the load placed on other amplifiers and speakers in the system, improving intelligibility and minimizing distortion. Additionally, utilizing a subwoofer isolates low frequencies, enhancing separation and increasing overall coverage of your performance area. The Electro-Voice EKX18SP is a self-powered subwoofer offering 1300 watts of efficient digital power driving an 18" EVS-C transducer. The components are top-shelf, the cabinetry and construction are ready for the road, and the exclusive QuickSmartDSP circuitry offers all the processing tools needed to sound your very best. The Electro-Voice EKX18SP is constructed using 15mm plywood and finished with an exclusive scuff-resistant EV Coat surface. Powder-coated 18 AWG steel grilles provide excellent protection. Deep-scoop recessed steel handles allow the EKX18SP to be moved with ease. A threaded M20 pole socket provides a solid base for elevating your mid/high speakers, thereby improving clarity and coverage. Slotted bass porting reduces distortion and provides tighter bass response. Inside, you’ll find a custom-designed EVS-C 18" bass transducer providing some serious muscle to push out those all-important lows. 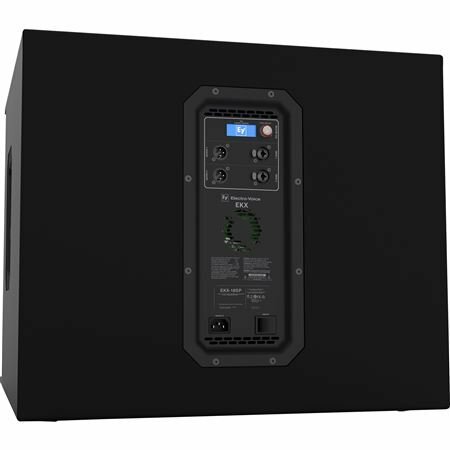 Lightweight, reliable, and energy efficient, the onboard digital amplifier delivers 1300 watts of power. Intelligent Thermal Management relies on multiple sensors tied to a variable-speed fan that keeps everything running cool and protects the voice coil. Input 1 and Input 2 are both equipped with individual XLR+1/4" TRS combo input jacks; an XLR output for each input is also provided for passing the signal along to the midrange and high frequency loudspeakers in your system. Accessed via the multi-function Master Volume knob and paired with an easy-to-read LCD screen, the QuickSmartDSP provides user access to sound-enhancing circuitry that ensures optimum performance in any venue. When using a subwoofer, it is important to select the correct crossover frequency. The EKX18SP offers crossover points of 80Hz, 100Hz, 120Hz, and 150Hz. In addition, there are also crossover points that were designed to specifically match other Electro-Voice portable sound products, including 12" and 15" powered loudspeakers in the EKX, ELX, and ZLX families. Other DSP options include choosing the program mode, such as music playback (MUSIC), live sound (LIVE), or club use (EDM). 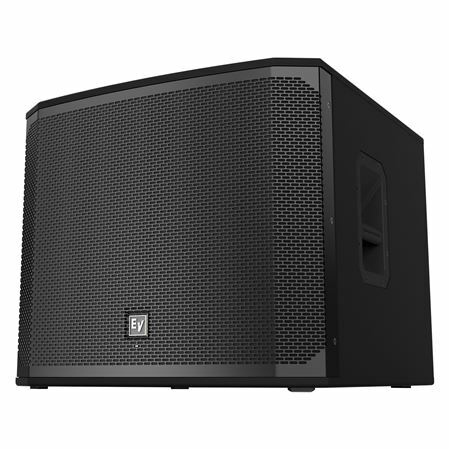 Cardioid Control Technology allows multiple EKX18SP powered subwoofers to be deployed in a single sound system, increasing bass coverage for the listening audience while reducing bass buildup in the stage area. Up to five custom settings can be stored and recalled on demand, while the Lock feature prevents unintentional altering of any settings. Additional menus control the LCD’s brightness, contrast, and dimming time for convenient viewing, as well as parameters for the Power LED, which can be set to indicate On or Off, or may be used as a Peak/Limiter indicator. Protect the EKX18SP sub with a stylish and durable Electro Voice EKX18SCVR Padded Cover! (sold separately) Proudly displaying the bold E-V logo, this cover blocks dirt, dust, and the elements and helps to negate the effects of bumps and impacts. All of this while allowing access to the hand grips for easy transportation. Maximum SPL: 134 dB peak dB Maximum SPL is measured at 1 m using broadband pink noise at maximum output. Great bass, but wish it was cheaper. Does need a little break in period. After a few hours of use it really starts to get louder and deeper. For $1000 I wish the lower frequencies were louder. They are there and sound good just not that loud without clipping. Overall though it's a great sub. Would be fantastic if price was about $800 instead though. For the most bang for your buck you should go for the EV 18p sub, just beautiful sound, light yet durable (I’ve actually had to carry myself a couple times) just an FYI there are two “clipper” lights that read “limit” they are just warnings, they are not really clipping. But if you still rather not chance it. Get yourself a compressor. Should be set up all nice after that. ???? Could use some wheels but it may mess with the sound. I have a pair of them. It’s all the sub woofer you need to do any gig. Unless you’re playing a stadium. They’re great. I am very satisfied with this subwoofer is is working out just fine. I use it at my gugs. I am new to the dj world and did a bunch of reviews before buying! I can honestly say I will be a lifetime EV fan! Bad to the bone!